Once upon a time… there was a little girl and her Papa and an idea about building a school at home. It almost takes my breath away to see how far it's come in such a short amount of time. It is so, so beautiful. And so many wonderful people have worked so hard to make it happen. The name Hardison Mill School comes from the area we live in, Hardison Mill. Which is also the name of our farm, because the Hardison's built and lived here in our old farmhouse. Their two youngest daughters, Mollie and Veva, were not only songwriters (I shared that story HERE), but in their older years, were schoolteachers at the original Hardison Mill School built in 1897. One of our wonderful neighbors, Jan Harris (who's incredibly gifted and passionate about the school) not only designed and planned the interior of the school, she's come on board as the director of the school. 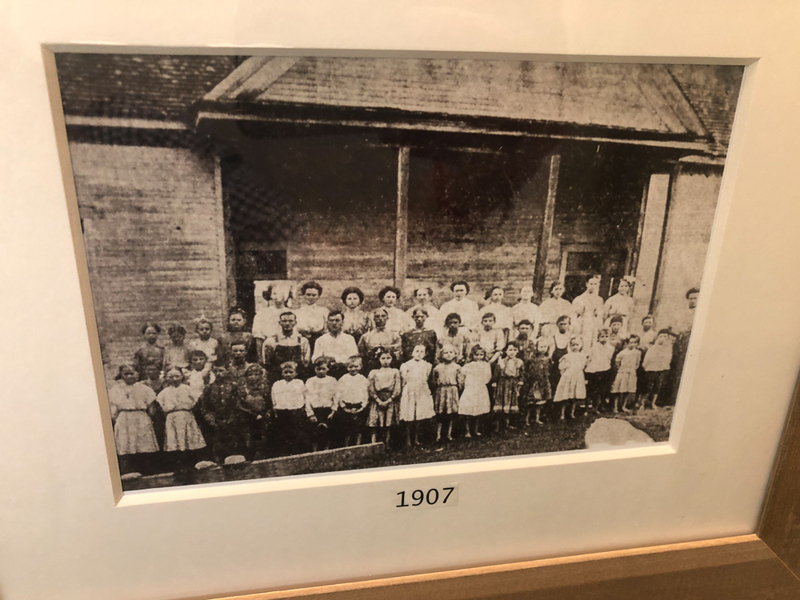 In the 1907 Hardison Mill School picture below, the little girl in the first row on the bottow left is Jan's grandmother, so Jan's ties to the school go back a long way. We have a number of other folks who are also helping us get everything ready for the doors to open. As you can imagine, it's a very busy time... the first day of class at our new schoolhouse is a month from today, September 10th. They are currently taking applictions, interviewing parents and kids, and will soon be selecting eleven students, which is such a tough job since there's so many wonderful people interested and only room for twelve little ones to go to school (including Indy). They are also looking for one more teacher who has a passion, not only for children, but also for rural life and getting back to the earth and some of the hands-on skills that have been lost along the way, in what seems like our culture's all-focused pursuit for higher education for everyone. It was humbling and amazing to see and feel the outpouring of love for our family from strangers. From people we've never even met and most likely never will. My hope at that time was that their beautiful gift would be used for a wonderful purpose, and it has. With my talented brother-in-law Keith Hunley overseeing the construction and Jan doing the designing, we were able to build the schoolhouse for almost exactly the total amount that was sent to us that spring. What a blessing! In the past few months since the main part of the schoolhouse has been completed, we've been using it for neighborhood Bible studies, as a nursery for the cowboy church that meets in the barn and a number of other things. But mostly we've been having Indy and a few little friends of hers spend time in there, getting a feel for what it's going to become, very soon. As we continue making plans for the future. Since Indiana is four-and-a-half years old now, this first year our school is going to be a pre-school, with a dozen kids going five days a week. Our hopes are that starting the second year, it will be multi-age... running and feeling more like a one room schoolhouse from days gone by. They are finishing adding an extra ten feet to the back of the schoolhouse so the kids not only have a kitchen where they will learn to cook the vegetables and food they'll be growing in the garden and on the farm, but it'll also be a lunch area and activity center where they can do messy art projects and other things. This past spring Jan created a drawing of what we imagine the completed school area will look like when it's all done. Soon, Lord willing, it will be a full farm school, where there'll be a playground and a garden with an orchard and a greenhouse, and a barn for animals for the kids to take care. There will be chickens to raise, trails in the woods to explore and fish in the pond to catch. As you can tell, we have lots of ideas for the school and are beyond excited to work towards them for the kiddos, no matter how long they might take. There have been a number of amazing folks who've sent things to the school over the past few months and even more who've asked me what they can do to help. So I wanted to share a couple of things that Jan and her team have put together. On Sunday September 9th (Joey's birthday), the day before the school opens, there's going to be a special chef-catered, four course HARVEST DINNER in our back field behind our farmhouse. It will be catered by the wonderful folks at Kindred Farm, and I will play some music and share stories. I think it will be an evening of amazing food and fellowship, and it will all go for a good cause...the schoolhouse. There's also going to be a big Celebrity Yard Sale in our concert hall (along with a big regular yard sale in the parking lot) on that Friday and Saturday, the 7th and 8th (from 7 am 'til 2 pm), where we (and a number of other celebrities) have donated some items for a fun event to help raise money for the school. The Harvest Dinner and the Celebrity Yard Sale details are on the event page HERE . All the proceeds go to help cover teacher's salaries and keep tuition costs down for kids and parents. I'm excited to see not only what Indiana and the other children are going to learn in the coming years at the schoolhouse, but also what I'm going to learn too. Indy wakes up everyday and asks "go to schoolhouse?'. It won't be long now and I'll be able to say "yes honey, schoolhouse!" and be able to take her hand and walk her to school every morning. What a beautiful, beautiful blessing. Thank you all so much. You can learn more about the school, or teaching position available, and follow along with Jan and the progress of the schoolhouse on their HARDISON MILL SCHOOL FACEBOOK PAGE. And of course, I will continue to share more stories and info as this special new chapter in our life continues to unfold.